Snakes can be frightening to most and are often venomous. 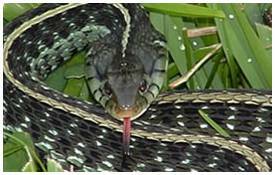 Call on the experience of Custom Pest Solutions to safely remove snakes. 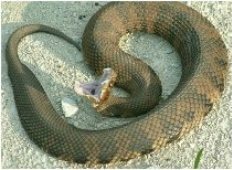 Even if you think the snake is non-venomous, don't take a chance, call us. 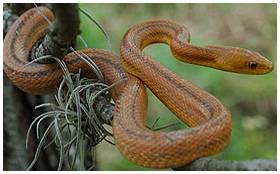 The non-venomous Eastern Rat Snake is primarily active at night. It is both a terrestrial burrower and an extremely good climber. It is found under rocks and boards, and in trees under bark and within knot holes and palm fronds. As its common name implies, this snake feeds voraciously on rodents. Its diet also includes lizards, frogs, and birds and their eggs. It lays eggs. Breeding occurs from April-July; eggs are laid during the summer, and newborns hatch from July-September. Non- Venoumous The handsome, active black racer is a commonly seen shiny black snake with a white chin. It regularly forages around houses and in suburban areas. 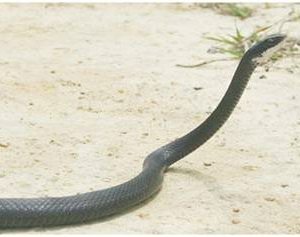 Black racers hunt during the day and are often seen moving quickly with their heads held high above the ground as they hunt for prey. They feed on frogs, rodents, and lizards. While they are non-venomous, these snakes will bite if picked up or cornered. These snakes are very fond of trash, so the best way to keep these snakes away is to make sure your trash is always locked up nice and tight. snakes. They are generally dark: olive, brown, or black. A lighter/darker cross banding pattern may be seen, especially on the sides. They are heavy bodied with keeled scales. Cottonmouths are common snakes found in wetlands, rivers, lakes, etc. Cottonmouths get their name from their defensive habit of gaping their mouths open to expose the white lining of the mouth. This is their way of warning potential aggressors to stay away. Cottonmouths can be aggressive. Unlike their Copperhead cousins, they will often stand their ground. Their venom is stronger and they tend to be larger snakes, making them very dangerous. Garter snakes are common throughout Florida and are found in a wide variety of habitats, including marshes, woodlands, and backyars. They tend to prefer moist, grassy environments and are often found near water, such as the edges of ponds, lakes, ditches, and canals. 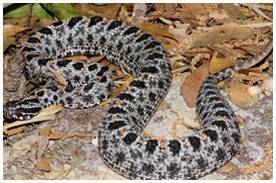 However, they are not always found near permanent water sources and may sometimes travel long distances from any water, They are common among the most commonly-encountered snakes in suburban areas, provided there is some cover (debris, boards, vegetation, logs, or rocks). Most individuals can be distinguished from other species by the presence of three yellow longitudinal stripes down a dark body. The non-venmous Scarlet King snake likely derives a degree of protection from potential predators via its mimetic coloration - appearing similar to venomous coral snakes. 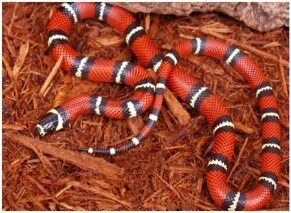 Though they are non-venomous themselves, the Scarlet King snake's confusion with the coral snakes is beneficial from a predator aversion standpoint. However, this same confusion is often detrimental to the scarlet king snake with regard to humans. King snakes use quick, jerky movements so that their bands flash, startling predators. Their bright colors signal danger and often confuse predators, making these snakes hard to follow. Milk snakes, also known as King snakes, get their name from an old belief that they drink milk from the udders of cows. This myth probably arose because Milk snakes were commonly spotted in barns and stables, where there is a concentration of rodents. "Red to yellow, kill a fellow; red to black, it's a friend of Jack," so goes the old saying. This method of remembering the color sequence of a coral snake works pretty well. This venomous Coral Snake is a relative of Old World cobras, people believe its bite nearly always is fatal, but that's not necessarily the case even though this snake is in the same family as neurotoxic cobras and mambas. The snake represents a true danger as small children may readily pick it up to show parents, thus providing ample opportunity for a bite from this otherwise rather docile reptile.